Note: Masses in bold are Schola Masses where student singer may receive a stipend; other Masses are those at which we are invited to participate. Schola Masses plus, in italics, other Masses where we are invited to join the singers. Times refer to services, nor rehearsals. 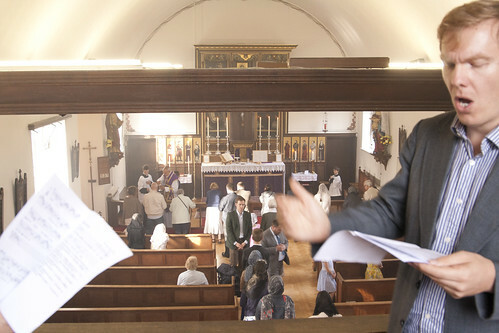 The Schola sang at some beautiful Masses this term, in a number of different places: Blackfriars, St Benet's Hall, SS Gregory & Augustine's in the Woodstock Road and as far away as Bedford. Above is Dominic Bevan, who led most of these Masses; below is our guest director, Prof Peter Kwasniewski. 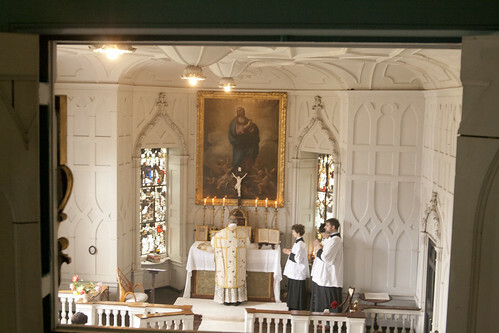 The final Masses of term included an annual celebration in the historic chapel of Milton Manor House, where the schola sings in an unusual loft with windows opening into the chapel: below. 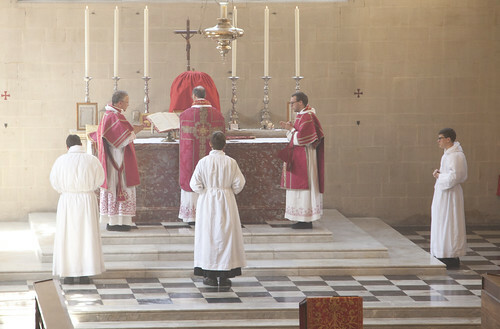 The last one of all was an unusual Mass of Reparation, a Votive Mass 'for the remission of sin', celebrated in SS Gregory & Augustine's, Oxford: above. Both of these Masses were led by Dominic Bevan. And so another academic year comes to an end. This year the Schola Abelis has sung at a larger number of churches than in recent years. We now have a regular termly slot in the English Martyrs, Didcot, in Holy Rood, Abingdon Road, in Blackfriars in Oxford, and in SS Gregory & Augustine's, as well as annual events in Milton Manor, Caversham, St Benet's Hall, and Long Crendon. 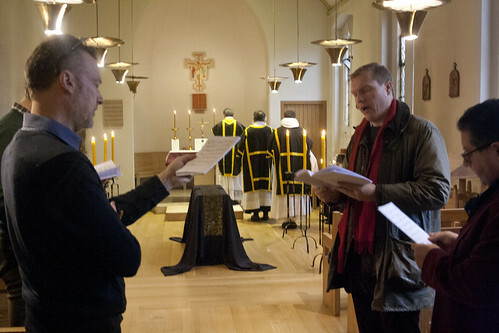 The Schola also plays a major part in the general availability of singers with experience of Chant to come along and sing at other Masses taking place in Oxford. 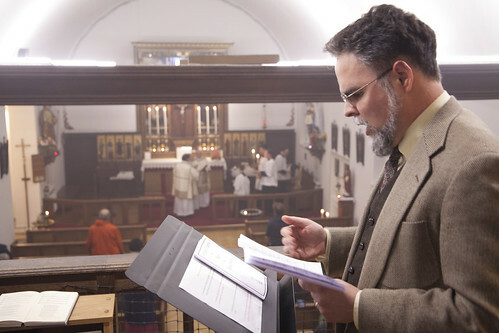 In both ways we are fulfilling the purposes for which we were established: to make chant available for the celebration of the traditional Catholic liturgy in the Oxford area. We have also had a lot of fun along the way. If you are reading this and are interested in singing Gregorian Chant in the 2018/19 academic year, contact us using the email address on the sidebar. We can also tell you about opportunities to sing, or hear chant sung, in Oxford over the Long Vacation. The Masses we have accompanied this term so far have been exceptionally interesting: notably, the Vigil of Pentecost in the Dominican Rite (above), and the Emeber Saturday of Pentecost (below), each with more chants than the standard Mass formulary, with Alleluia verses between the Prophecies in the 'vigil' part of the service. 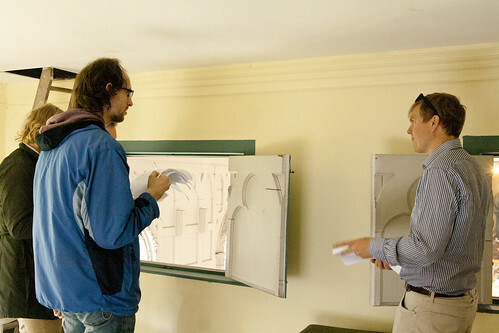 We provided relatively large scholas, of eight, for each of these occasions, which is particularly good going for the exam season. If you have heard us, or like our videos, please make a donation! Founded in 2006 as a student society of Oxford University, we are an all-male chant schola singing Gregorian Chant; we sometimes sing with a mixed polyphonic consort specialising in Renaissance Polyphony. We sing this music in its intended setting in the Traditional Liturgy of the Roman Catholic Church, in association with the Latin Mass Society. We are a founder member of the Gregorian Chant Network. See our Gloria TV album of videos.